After his defeat to Rafael dos Anjos, it makes the prospect of an eventual meeting with Conor McGregor even less likely. JUST A FORTNIGHT ago, a bout between UFC featherweight champion Conor McGregor and Donald Cerrone seemed a distinct possibility. With McGregor being promised a shot at the winner of the lightweight title bout between champion Rafael dos Anjos and challenger Cerrone, a win for ‘Cowboy’ would have set up a clash of two fan favourites for the 155lbs crown in 2016. However, Cerrone came up short in Orlando on 19 December so that won’t be happening for now. In fact, it’s a fight that may never take place at all after the UFC announced tonight that Cerrone is moving up to welterweight. The 32-year-old heads to the 170lbs division for the first time to face fellow American fighter Tim Means in the main event at UFC Fight Night 82, which is set to take place in Pittsburgh on 21 February. It represents another swift turnaround for Cerrone, who’ll be fighting for the seventh time in just over 18 months. It’ll be his 20th bout in total since his move to the UFC from the WEC five years ago. A potential bout between Cerrone and McGregor had been building since the pair exchanged words at the UFC’s ‘Go Big’ press conference back in September. Cerrone continued to express some strong views on the possibility when he spoke to The42 in Las Vegas before UFC 194 last month. It’s not yet known whether Cerrone’s move to the welterweight division is permanent or merely temporary, but it’s something he has hinted at in the past. Email “Donald 'Cowboy' Cerrone moves to welterweight for UFC headliner”. 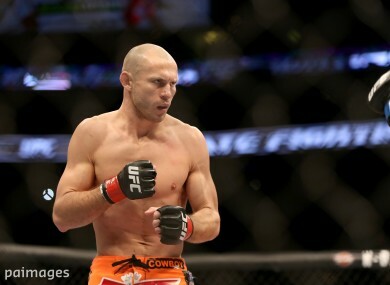 Feedback on “Donald 'Cowboy' Cerrone moves to welterweight for UFC headliner”.